Image copyright CBSThe US justice department has indicted 12 Russian intelligence officers for hacking Democratic officials in the 2016 election. Special Counsel Robert Mueller's inquiry is looking into alleged Russia meddling in the 2016 election. The investigation has already indicted 20 people and three companies. The indictment says the named Russian intelligence officers began their cyber-attacks in March 2016 to hack the email accounts of volunteers and employees of Hillary Clinton's presidential campaign. Mr Rosenstein said the defendants corresponded with several Americans during the alleged conspiracy, but added there is no allegation that any US citizen committed a crime. He said they also "conspired to hack into the computers of state boards of elections, secretaries of state, and US companies that supplied software and other technology related to the administration of elections to steal voter data stored on those computers". 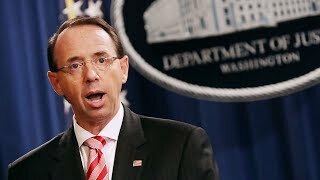 Mr Rosenstein said: "The defendants covertly monitored the computers, implanted hundreds of files containing malicious computer code, and stole emails and other documents." The indictment states the conspirators searched a campaign committee computer specifically for terms including "Hillary", "Cruz", "Trump" and "Benghazi Investigations". 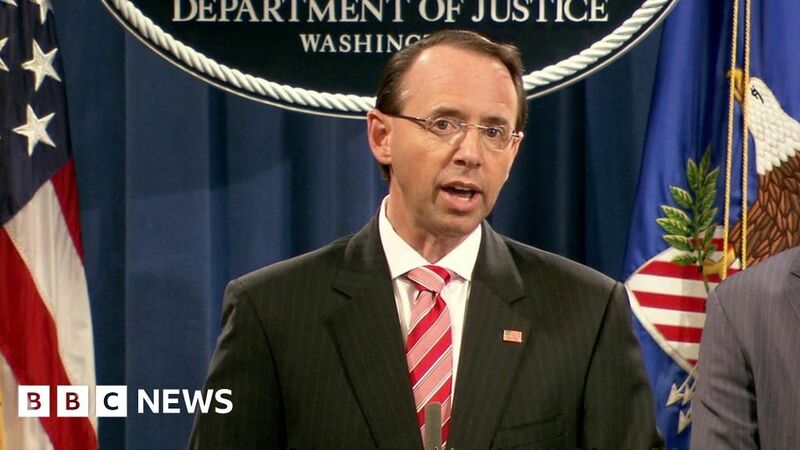 Mr Rosenstein said the conspirators created fictitious online personas, including "DCLeaks" and "Guccifer 2.0", using these identities to release thousands of stolen emails and other documents from June 2016. According to the indictment, a US congressional candidate in 2016 requested stolen documents from the Russians posing as Guccifer 2.0 - who then "sent the candidate stolen documents related to the candidate's opponent". The candidate was not identified. Mr Rosenstein said: "We know that the goal of the conspirators was to have an impact on the election. "What impact they may have had, what their motivation may have been independently of what's required to prove this offence, is a matter of speculation. That's not our responsibility." What did the hackers find out? The DNC leak showed that top Democrats preferred Mrs Clinton for the presidential nomination and soured relations with supporters of liberal challenger, Bernie Sanders. Clinton campaign manager John Podesta's emails were also hacked. Mr Rosenstein also said that the hackers were able to steal information on 500,000 voters from a state election board website. If the Russian military had dropped a bomb on the headquarters of a US political party, it would be an act of war. If it had launched a missile at the home of the chair of a US presidential campaign, that would be a casus belli. This isn't what happened, of course, but make no mistake, what the US Department of Justice is alleging - a cyber-attack by Russian military officers against a US political party and its leaders - is, or at least should be, equally inflammatory. The wreckage of what Robert Mueller's team says were Russian strikes on the US can be measured in damaged reputations and disrupted politics. After days of sharply criticising US allies, the world will closely watch how the president handles allegations of "virtual" warfare against the US when he sits down with the man whose military is accused of being behind it all. Media captionMr Trump was once popular in Russia, but opinion there has turned against him since he came into officeWhat has Trump said? The deputy attorney general said he had briefed President Donald Trump about the indictments earlier in the week. Mr Trump, who is in the UK, had repeatedly dismissed the investigation as a "witch hunt". He has commented in the past that "a 14-year-old" could have been behind the hacks. During a joint news conference with British Prime Minister Theresa May on Friday, Mr Trump said he loves the US, but also loves "getting along with Russia and China and other countries". "We have this stupidity going on, pure stupidity, but it makes it very hard to do something with Russia because, anything you do, it's like: 'Russia, oh he loves Russia'," he said. The indictment comes just three days before the president is scheduled to meet with Russian President Vladimir Putin at a summit in Helsinki. White House spokeswoman Lindsay Walters released a statement saying the new information "is consistent with what we have been saying all along". Media captionPutin laughs at political chaos in USWho are the defendants? The Russians indicted are not in US custody nor is it likely that they will ever serve jail time. The deputy attorney general said all 12 of the defendants were military officers in the Russian intelligence service, the GRU. 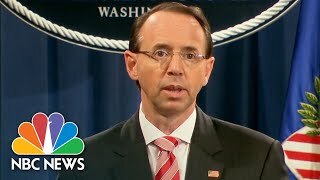 Mr Rosenstein said they worked for two units: one was involved in actively stealing information while the other was responsible for disseminating this stolen information. The defendants are named in the indictment as Viktor Netyksho, Boris Antonov, Dmitry Badin, Ivan Yermakov, Aleksey Lukashev, Sergey Morgachev, Nikolay Kozachek, Pavel Yershov, Artem Malyshev, Aleksandr Osadchuk and Aleksey Potemkin. Image caption Special counsel Robert Mueller has indicted 32 people and three companiesWhat's the big picture? The Mueller inquiry is looking into US intelligence findings that Russians conspired to tilt the election in Mr Trump's favour, and whether any of his campaign aides colluded with this alleged plot. The investigation has already indicted 20 people - mostly Russian nationals - as well as three companies and four former Trump advisers.